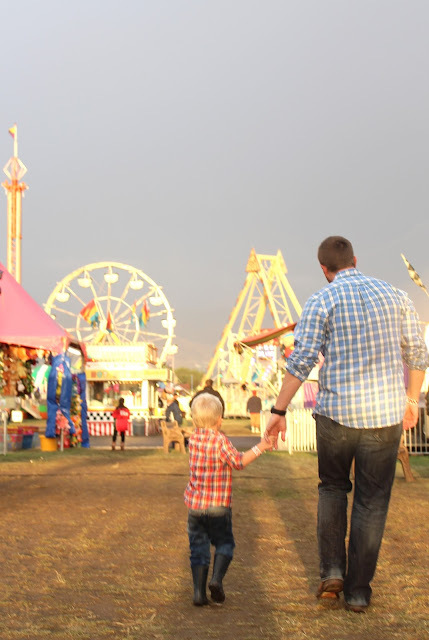 The state fair always brings the beginning of cooler evenings & the smells of the harvest season. There is a new crispness in the air. It's where memories from my childhood flood right back while I devour some fluffy, pink cotton candy! Our annual trip to the fair is one of my favorite family traditions. I loved visiting the fair as a child, but this may be one of those things that I enjoy even more as a parent! 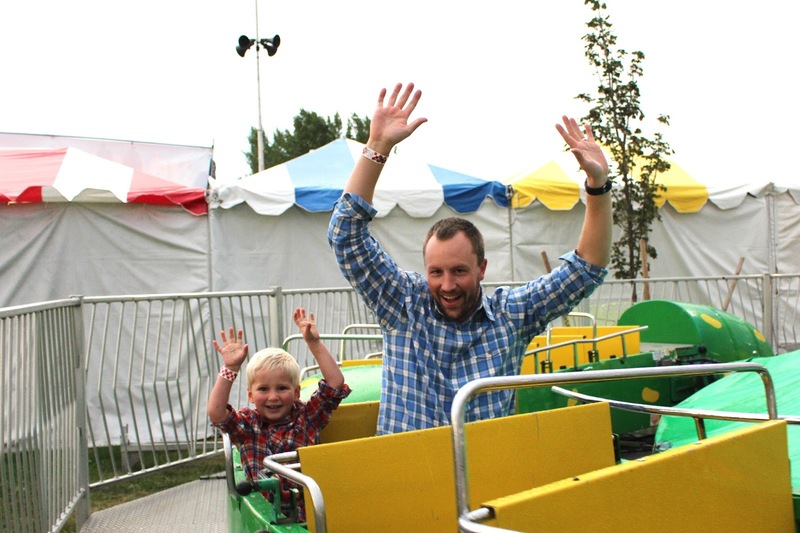 We had an usual amount of storms roll through Utah last week, so I was overly worried that we would have to miss out on a fair visit this year. I was stalking the weather like a crazy woman, waiting to see when our best chance for a dry evening would be. I am such a planner, so the unpredictable weather was driving me batty. On Tuesday evening, just as we were were about to make dinner, the skies looked clear! 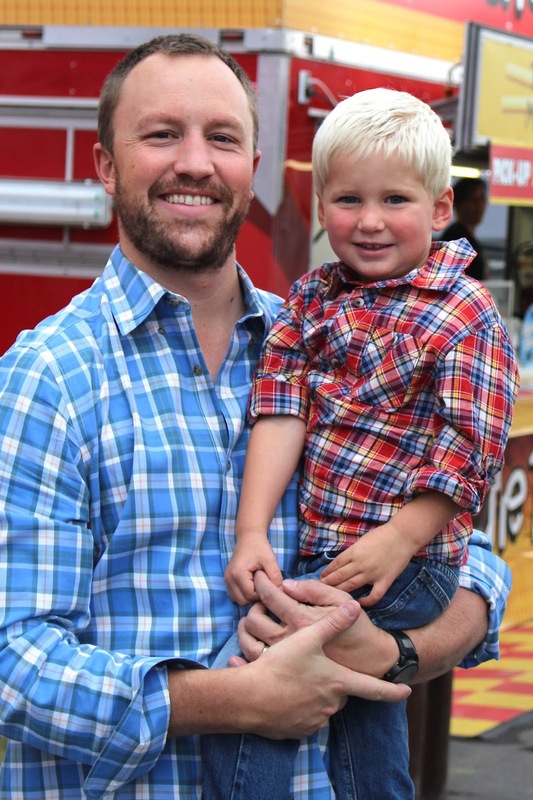 We quickly (well as quickly as you can move a baby & toddler) dressed everyone in rain boots (surely the fair grounds would be muddy due to all the rain) and plaid (because fair attire...) and were on our way! All the previous rain must have scared away any potential visitors, because we literally had the fairgrounds to ourselves! 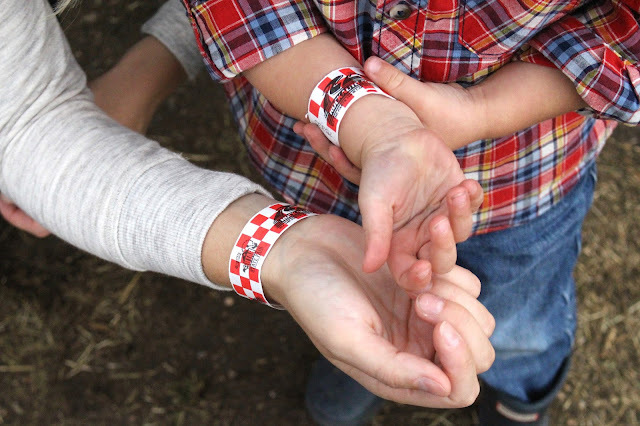 Wristbands for endless rides all around! We didn't wait in one line, and were often the only people on any given ride! Liam wild smile never left his face! He ran from one ride to the next, and somehow I managed to keep up. I only became nauseous once (thank you teeny tiny helicopter ride) and Liam escaped with only a minor injury (thank you house of mirrors & an overly confident toddler). 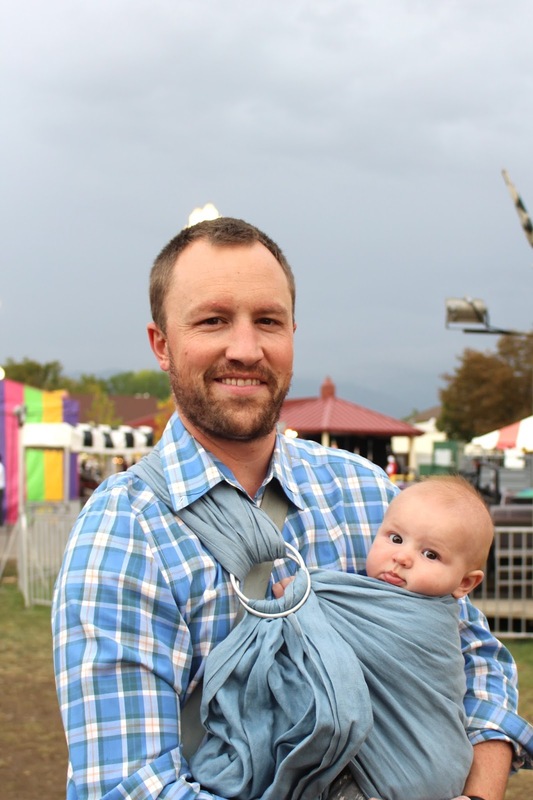 While big brother fulfilled all of his fair dreams, Finn watched from the sling. He was in awe of all the sights & sounds. For hours he looked around wide eyed, barely making a peep. I had forgotten what a fun age 4 months is! Finn has woken up the world and is simply captivated by it all! It's incredible to watch him see things for the first time! 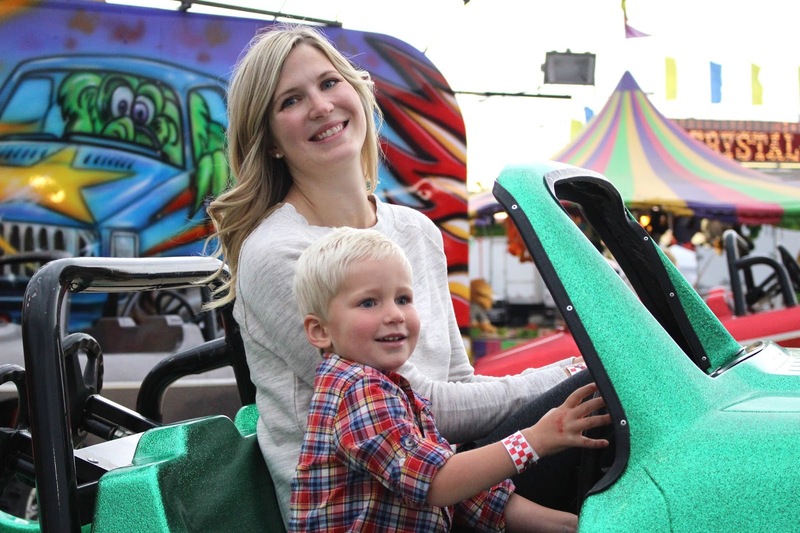 While typically we spend plenty of time with all the fair animals as well, it was difficult to pull Liam away from the rides. During a short period of rain, we escaped for a bit to check out the cows, goats, & pigs, but we were quickly dragged back outside to see the rainbow and all the rides we had yet to try. I believe the fair is best experienced at Sunset, and this year was no exception. As the sun went down, that golden glow covered the fairgrounds, and I found even myself in awe of our family evening. Another memorable night. Liam will surely remember these times for many years to come! Liam is getting so handsome! And you are just gorgeous mama! What a fun day for all of y'all, especially without any lines, the best time. I love fairs. And can I just say how adorable Finn is. Beautiful photos! I'm jealous of the fairs out west! They just seem so much bigger and more elaborate than the little pop up fairs we get out here. I'm sure you can give a real comparison having lived on both sides of the country. looks like so much fun and how awesome the rain scared everyone else off. Liam's smile is so big, he's such a cutie! oh my gosh, I can't handle how cute Finn is in that sling. Liam looks like he had a ball! Looks like so much fun! Scarlett loved the fair this year, I'm not a huge fan of them but it was worth it to see how much fun S had! That is so great that you had the place to yourselves! And that smile is the best. Looks like so much fun. I'm glad the weather cooperated enough for you guys to visit! I've said this before but you have the world's cutest family! Glad you found a dry evening to enjoy the fair! Liam's face in that red car ride. Priceless!!! 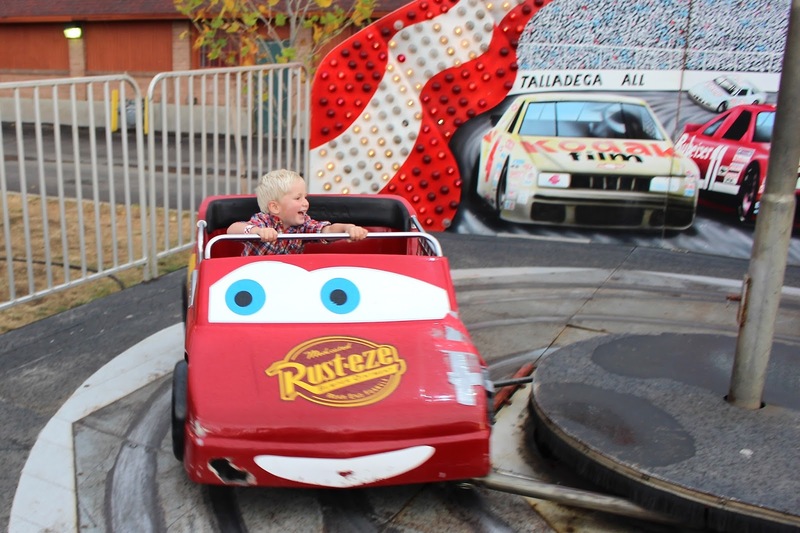 How fun to basically have the entire fairgrounds to yourself! Such an amazing night! 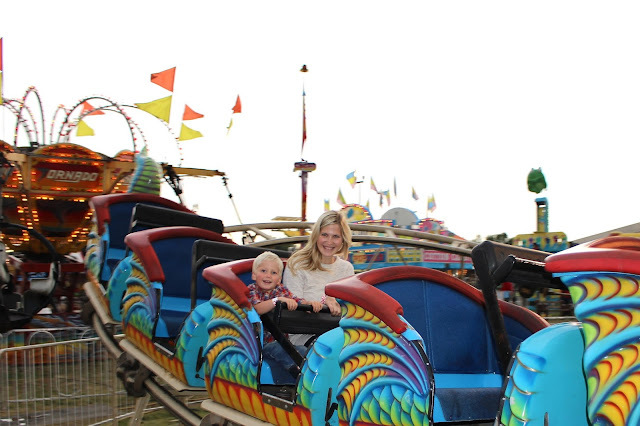 What a PERFECT fair trip! We went in the morning and it was definitely the wrong time to go. I think at night, with all the lights, and the ambiance would have been so much better. Next year! This looks perfect! Wyatt would probably enjoy a fair with no people--ha! This looks like so much fun! I love the shots of you and Liam on the rides together. Your boys are both so adorable!